Comer comida chatarra de vez en cuando no está mal, sin embargo, convertirlo en un estilo de vida es caminar hacia una muerte lenta y dolorosa. 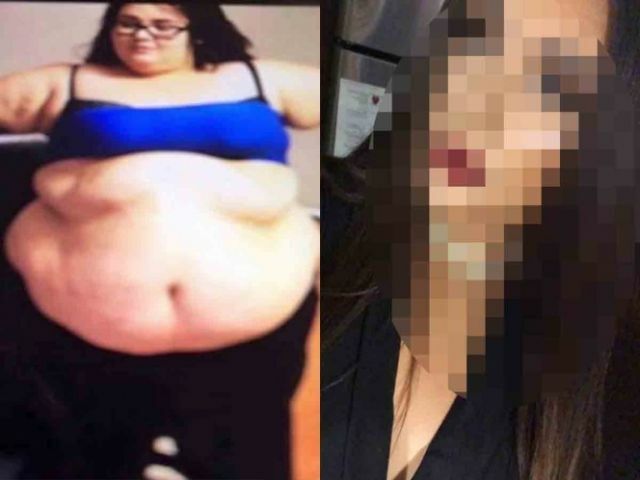 Esto lo sabe bien Alisysha Mc Nair, una joven de 21 años que a sus 17 llegó a pesar 170 kilos. De acuerdo con información de Mirror, fue víctima de bullying durante mucho tiempo. Lo peor llegó un día que casi se ahoga bebiendo un refresco. "Estaba desesperada por cambiar. No podía seguir ninguna dieta. Después de ahogarme un día bebiendo un refresco, tuve que esforzarme por recuperar el aliento, me di cuenta que se trataba de morir o cambiar”. A raíz de ello, inició un tratamiento médico y se inscribió a un gimnasio. Poco a poco comenzó a notar pequeños cambios en su cuerpo, que después se convirtieron en transformaciones radicales. Al terminar el tratamiento,McNair comenzó un curso como entrenadora personal para ayudar a quienes pasan por lo mismo que ella. "Me siento y me veo completamente diferente, y he decidido convertirme en una entrenadora para ayudar”. Same person, 2 years apart. And minus over 100lbs. This blows my mind, especially because I have a mental battle almost daily with myself on how I look, I feel like I won’t have a chin line, or feel pretty. I feel like I’m still 373 pounds even though I’m not, I know I have lost weight but everyday it almost doesn’t feel real. Until I do a comparison photo and I look at the two. It blows my mind myself and is still hard for me to process, the thing I find the most weird is when I was the way I looked of the left, I thought I looked the way i do on the right. Now that I look like that, I feel like I still look like the photo on the left. Everyday I work on self development, listen to podcast and have been adding mediation in. Because I want to better myself mentally and I can feel myself growing every single day. I’m feeling more confident again, and am doing so much better mentally. It takes time though, the point of this is. It NEVER matters what you look like, but what you think of yourself and how you see yourself. So if you want to change please do it for you, not anyone else otherwise you’ll never ever be satisfied with the work you have put in. This is coming from a girl who has change her life completely, lost 185 pounds, got her dream job, dream life, condo, view, and place that she wanted to live and I still wasn’t happy. I even look the way I always wanted to. But I didn’t work on my brain, I did before I got injured this time last year I was ultimately fearless and I knew I was worthy and amazing and would do anything and I MEAN ANYTHING I set my mind to do. That’s why I am where I am today, I have fallen back since then. But I refuse to give up, I will reach the point where I am ultimately fearless again, and the only person stopping me is myself. It’s time become and even better me in 2019 for me. Have a wonderful day everyone, never give up on your goals you got this! Life changes, but don’t get caught up in what’s around you. If you want something ask yourself how bad do I want it, are you willing to put in that effort, whether it’s weight loss, friends, career, vacation. Ask yourself what your values are, where do you see yourself in 1-5 years. Figure out where you want to be, then find out what you’re going to have to do everyday to get yourself there. It doesn’t happen over night, you aren’t in your current situation from an overnight change, it took years to build those habits it’s going to take months - years to break them. One thing I’ve learned is to stop stressing and over thinking, I still do it all the time. I always remind myself is it worth it to stress over seriously nothing. My favourite line is this, “ Do you have a problem, yes, can you fix it? Yes. Then why worry?” “ do you have a problem, yes, can you fix it? No. Then why worry” something I need to practice more. It helps cool down my brain a lot and helps me refocus. Work on yourself and development if you want to, go do that crazy adventure you have been thinking about. Go out there and just be you, is the first jump off a cliff easy? No it’s, it’s scary. You have all these thoughts in your head telling you no but your soul wants the jump. Take a few breaths, clear your mind. Count to 3 and then jump. Feel free, chase those dreams or goals whatever they may be. I never used to live this life, everyday it feels unreal. I am very grateful for my life and everything and everyone in it. Things get hard you realize sometimes being alone is way better and more beneficial for you in the end instead of surround yourself around people. Think for yourself and try to not let others around you influence your decisions and choices for better your life in the way that you want to. These two photos still blow me away I don’t know when I’ll ever fully accept the accomplishments I’ve made, but I know I’ll get there and I’m going to keep working on myself and focus on what is best for me, because I do want to help people but I can’t if my own head isn’t in the game. From 16/17 on the left 373 pounds, to 208 pounds. 185 pounds weight loss, 30 pound muscle gain. Another face to face transformation for you guys in honour of face to face Friday’s ! I still can’t get over that these photos were 4 years taken apart I always wanted to look the way I do today but didn’t know if it was fully possible I’m so grateful for my life and everything in it ! Always remember watching everyone be able to work out or do the makeup I can now. Trust me it is possible if you hang in there and stick it through ! I know days are hard, I know they get stressful and uncomfortable but that’s a good thing that means things are changing and you are growing. Self awareness is key and when you can recognize that things aren’t as bad or big of a deal as they seem it’s very helpful. Just hang in there, and remember to take each moment as it is. It’s going to be okay  just breathe.